Longboards have become the most preferred method of transport for most youths, and even adults, today. And why not? This thing is a godsend for people who are looking for more affordable means of transports. But that’s not all a longboard is good for; there are heaps of other reasons why people, especially girls, now prefer their longboards to their work or college over Uber. Interested? 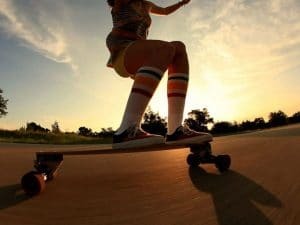 Well, then stick with us and continue reading our article as we review some of the Best longboards for girls, and what goes in the making the best of the best ones! Whether you are looking forward to converting to a longboard or looking for a replacement for your old one; we have it all. So take a few minutes to sit back and read through what’s going to be your next longboard. Let’s start! One more thing, you can read our article longboards for the beginners before start to read it. Best longboard for girls: tried and tested! We know how expensive quality longboard can be. And to therefore cater to people on a tight budget, we have for you the Natural Blank & Stained Assembled Complete Longboard Skateboard from SCSK8. The Natural Blank & Stained Assembled Complete Longboard Skateboard is as basic and straightforward of a longboard as they come these. The board maintains more of a cruiser shape and is therefore ideal for transport and getting from one place to another. And to furthermore add to the transportation value of the Natural Blank & Stained Assembled Complete Longboard Skateboard, you have the SCSK8 Precision ABEC 9 Red Bearings and 7-inch wide aluminum trucks on an 8-inch wide board. This means more even weight distribution and therefore more control and stability when carving and taking a turn. Speaking of a board, the Natural Blank & Stained Assembled Complete Longboard Skateboard use one made out of 7 plies of maple wood, which is durable and strong. Which bring us to the weight limit, the longboard can accommodate up to 220 pounds in weight so that’s not bad. Then, comes the visual appeal. This deck in layers with the SCSK8’s Pro Black Grip Tape and well, if you like to stand out, then you found your longboard because this guy is an explosion of color and images! But it comes in various sizes and graphic so you can choose your personal favorite, of course. Apart from all these, what we really appreciate about the Natural Blank & Stained Assembled Complete Longboard Skateboard is its speed. And this is majorly all thanks to its wide diameter 70mm PU wheels which make it a great ride even on rough, uneven surfaces. A great beginner board, and all for less than your next stop to McDonald’s! Click here to see full review! Next, on our list, we have the Freestyle Topmount Longboard from Rimable which is one of the Best longboards for girls if you are looking for something funky and high-speed! The Rimable Freestyle Topmount Longboard, fist of all, has a 42-inch long and 9.5-inch wide deck or boards. This, of course, means you get plenty of legroom space and therefore more control, and stability. Speaking of stability, this longboard uses a 7-inch Topmount Aluminium truck which offers you more control and balance. As for the board itself, you get a 9-ply full maple deck topped with a grip tape that is matte black. Strong yet simple and subtle. No hibby gibbies. The OS 780 Grip Tape furthermore keeps nicely gripped and established on the board for the ride ahead. Now, that we are talking about the ride, you may want to know about the wheels. The wheels used on the Rimable Freestyle Topmount Longboard are 70mm x 51mm wide, making them ideal for rough surfaces. Also, gives them speed! The wheels are furthermore 78A PU Rimable longboard wheels, which therefore makes them a tad bit on the softer side, but this is what gives them amazing tackiness and grip. Great for rough, difficult and uneven surfaces! The Rimable Freestyle Topmount Longboard is absolutely a fantastic longboard for people who are just starting out on these. It is simple to use, offers a basic design and is furthermore super affordable for beginners on a budget. 3rd longboard on our list of the Best longboard for girls is the Downhill Maple Longboard from MINORITY. If you are all about speed, then this is the board for you! The MINORITY Downhill Maple Longboard, as you can guess from its name already, perfect for riding downhills. And its pointy board, of course, adds to the acceleration. However, the best parts about the MINORITY Downhill Maple Longboard is in its quality design and chic construction. The board is made out of 8-ply pure maple wood which should stand the test of time and weight. You furthermore have authentic ABEC 7-speed bearings on its 7-inch aluminum drop-through truck. Now, keep in mind that the MINORITY Downhill Maple Longboard itself is 10 inches wide and 40 inches long. This gives you great leg space and eventually offers you more even weight distribution and therefore more stability and control. And the grip tape is obviously there to offer tack to your feet while you speed away. Overall, the MINORITY Downhill Maple Longboard is definitely made for the streets. It does great on uneven, rough and angular surfaces without compromising on your comfort. What’s really nice about this longboard, however, is that it is designed with the help of multiple designers to give it that unique and fresh look. Comes in heaps of sizes and graphics too! But the true and final credits go to the MINORITY Downhill Maple Longboard’s quality assurance team. This longboard reaches you only after passing various standards tests to ensure quality and performance. We are obviously pretty happy about that! The Volador Basic Cruiser Longboard isn’t just one of the Best longboards for girls, but it is furthermore one of the most well-rated and popular boards right now! If you didn’t catch the name by now, the Volador Basic Cruiser Longboard is well made for some quality cruising. It uses a 40-inch long boards which are about 9 inches in width. You clearly have a lot of leg room for a comfortable cruise. Speaking of the board, the Volador Basic Cruiser Longboard uses a pure maple deck which should last you through many rough rides. Also speaking of which, the wheel son this longboard make it absolutely ideal for rough, uneven surfaces. Most importantly, you have a 40-degree base, giving you some good carving flex, and 180mm hangers with aluminum die-cast trucks. The wheels are 70mm diameter, meaning you cover more distance. In terms of hardness, they are 78A which means they are soft and are therefore offering more tackiness and gripping power. Now that we are talking about grip, the Volador Basic Cruiser Longboard also offers a great grip on your feet thanks to its grip tape which is rated Coarse OS780. Apart from all these, this longboard is very youthful and visually ecstatic thanks to its bright, vivid and neon color combination. You but also have various sizes and more colors to choose from! One thing many users admire about the Volador Basic Cruiser Longboard is its ABEC 9 bearings with high-speed lubricant. One of the best in class and it really shines through in its performance! And if those weren’t enough, it also comes with a 6-month warranty! The Pin-Tail Longboard from Atom is easily one of the Best longboards for girls if what you are looking for is some smooth and hassle-free cruising that glides through the roads like butter. The Pin-Tail Longboard, first of all, features the classical pintail board. This, as well all know, is absolutely perfect for speed cruising. The deck itself is 39 inches long and is about 9.5 inches wide. This makes the Pin-Tail Longboard very comfortable and roomy for the user’s feet. Speaking of which, the 80S grip tape on top of the deck is furthermore there to help offer the user that much needed foot traction while cruising. As for the deck, it is made purely out of high-quality maple wood which should be able to stand up to the challenging roads ahead. Then, you have 8.5-inch aluminum trucks with ABEC 5 bearings under the 9.5 wide deck, which only means one thing and one thing only: better weight distribution. This, therefore, makes for amazing stability and control. Speaking of control, the wheels used on the Atom Pin-Tail Longboard are 65mm urethane wheels with a hardness of 78A. This means the wheels are somewhat on the softer side, and thus offers amazing grip and bite on the surface. Apart from all these, the Atom Pin-Tail Longboard, like most of our longboards o the list so far, comes in heaps of sizes and multiple color combinations for you to choose from! The Atom Pin-Tail Longboard- minimal, funky and super comfortable cruising. Definitely worth a look into! And the 6th contender to make it to our list of the Best longboard for girls is the Dervish Sama Flex 3 from Loaded Boards. The Dervish Sama Flex 3 is easy of the more well-rated and loved longboards in the marker? And the reason is its high-quality construction and standout design. The Dervish Sama Flex 3 has a deck that measures 42.8 inches in length and is furthermore 9 inches in width. You therefore clearly have a lot of leg space for easy and comfortable cruising. And to make sure that your feet stick stably and securely on the board through the whole transport, the Dervish Sama Flex 3 has a Black ML Grip tape on top on it. As for the deck, unlike most of our maple wood decks previously, the Sama Flex 3 is made from a flex, bamboo composite which is ready to take on weight as far much as 150 pounds. Perfect for juniors and teens looking for some easy cruising. The bearings used are SL on a Paris 180mm Black Longboard Truck. The width of the truck in ratio with the width of the deck itself is close. This, therefore, means better weight distribution and more control, while making turns and carving. Now, comes the wheel. The Devish Sama Flex 3 uses Orangatang Durian Purple 75mm 83a Longboard Wheels. The diameter makes its perfect for speed and acceleration while the durometer of 83a means it is more hard, less tacky. Ideal for rough streets. One thing we really like about the Loaded Board’s flex series is that it comes in heaps of colors, and more importantly 2 more flex sizes: 1 and 2, which offer a higher weight limit for the big kids! And the 7th name to make it our list of the Best longboard for girls is yet again from Loaded boards. But this time, we are back with the Tesseract Premium! The Loaded Boards Tesseract Premium is definitely a notch above the Dervish Sama Flex 3 in terms of construction and comfort. First of all, this longboard is perfect for cruising as opposed to downhill speeding. It has a really nice, wide and slight concave deck which makes for one of the most comfortable and easy user experience on the streets. The deck is 36 inches in length and 9.5 inches wide. You, therefore, have plenty of leg space and room. It also has the Loaded Custom Grip Tape to add tack and grip to your feet on the board. As for the internal mechanisms, the Loaded Boards Tesseract Premium uses SL Abec 7 Bearings on a caliber White 180mm truck. The width of the truck in comparison of the width of the deck makes for excellent stability and user control thanks to an even weight distribution. One thing that’s furthermore nice about this truck is that it has a 50-degree base which makes the board slightly flexible. As a result, you get more carving and turning competence on the streets. Finally, you get this board in 1 color and 1 size, but it is pretty darn sturdy and competent so we don’t mind cutting off the freedom of options and choices! Finally, for the wheel, the Tesseract Premium uses 70mm wide Orangatang Stimulus Freeride Yellow Longboard Wheels. This size makes sure you can reach high speeds as fast as possible. The wheels furthermore have a hardness of 86a, which is perfect for rough surfaces. Sector 9 is said to produce some of the Best longboards for girls, and the one we have on our radar today is the very popular Meridian! The Meridian Longboard is THE thing to get if you are into downhill cruising. This is all thanks to its very special deck which portrays a concave and curvy shape to along, along with it pointy tips which make downhill cruising a treat. The deck is made out of 8-ply maple wood which you can expect to outlast the rough streets. It is in fact strong enough to accommodate about 274 pounds of body weight! That’s one of the highest weight limits on our list of the Best longboard for girls…so far! As for the dimensions, the deck measures 40 inches in length and 10 inches in width which gives you plenty of leg room for an easier and smoother ride. Speaking of which, the trucks used on the Meridian are Paris V2 180mm which offers you furthermore stability and control since it almost matches the width of the deck. It also offers you a 50° RKP base plate and Bones Mini Logo Bearings, giving you some flex and mobility for smoothers turns and carving.You finally have the grip tape on top for added feet grip. The Meridian Complete Longboard comes in s single color and size only, but we’re good with it as long as it gets the job done! This longboard is ideal for rough, uneven road. This is due to its large 72mm wheels with a hardness of 78a. And with a weight limit like that, it is great for both kids and adults! The Nicaragua Cruiser Longboard is made for some very high speed and heavy-duty cruising. It is made from some of the most premium and responsible materials as well. First of all the construction of the deck involves 5 layers of high quality and vertically laminated bamboo. It is strong, durable and environmentally friendly as well! The deck measures almost 40 inches in length and 8 inches in width, giving you more than enough leg space for comfortable and no-fidget cruising. The trucks used on the Nicaragua Cruiser Longboard are 9″ GULLWING chargers which amazing stability and weight distribution against the width of the deck. It furthermore uses ABEC 7 bearings. What’s really unique to this longboard is that, unlike every other longboard on our list, it uses a clear grip tape. This is of course to showcase the beauty of the natural bamboo the deck is made of. Finally, you have the 65mm 9-ball wheels which offer unmatched speed and agility, even over rough, hard surfaces! The Nicaragua Cruiser Longboard comes in the same size and graphics. However, you do get to choose between 2 different shades of wheels. And our final pick for the Best longboard for girls is definitely worth the splurge if you like the finer things in life. It is the Catalyst Longboard from the very renowned, very popular longboard company, Arbour! The Arbor Catalyst Longboard is the best thing money can buy if you are looking for some freestyling and sliding board actions. The deck is made out of fiberglass and maple and is slightly concave to give you the strongest and most comfortable cruising experience. As for the dimensions, the deck is a good 42 inches long and a little over 9 inches wide. Clearly, you won’t be struggling with leg room. Apart from this, the Catalyst Longboard uses a Paris 180 trucks with ABEC 5 Bearings with spacers for the ultimate balance and stability. It furthermore offers a little flex to the deck which makes it perfect for carving, turning and of course, freestyle cruising. When it comes to the wheels, this longboard uses large 70mm diameter wheels which pick up speed very fast. And for hardness, the wheel is a 78a which is a little bit on the softer side, but that is exactly what makes it perfect for rough, even streets since the soft wheel has more grip and bite to them. One thing that will instantly grab your attention about the Arbor Catalyst Longboard is that it has a very unique and catchy look and appeal to it. Well, it is a designer after all! Last but not least, this board comes in 2 different sizes for you to choose from. The deck is, of course, one of the most important components of the longboard. And the first thing you need to decide about it is the purpose of getting the longboard in the first place. If you are looking for a longboard as a method of commute and transport from one place to another, then we recommend getting a cruiser deck. These boards offer smoother carving and turning, and more stability. Perfect for commuters and beginner longboarders! On the other hand, if you are looking for something to something that is more about speed and tricks, then get yourself a downhill board. These boards tend to be flatter with a wider wheelbase, therefore offering you more stability. They are not as beginner friendly since they pick up speed very fast, and need a little more practice before mastering. Knowing what the deck of your board is made of is important, of course. And although maple is the most common and widely used material on the market, this is soon changing with the introduction of more affordable and sustainable options. Maple is very sturdy and durable. And more or less all longboards use multiple layers or plies of this timber in the making of the deck. Bamboo is just as a study, but it offers a slight flex to the deck, which is for cruising and cruiser longboards where taking turns and carving is important. It is furthermore thinner and more lightweight. However, one of the most important reasons behind bamboo becoming the preferred deck material is that it is also environmentally friendly. Carbon fiber is one of the most expensive and coveted materials a deck can be made of. And most decks today will often use a mix of carbon fiber with another material. Decks made out this material will have a foam core which helps cushion the user’s weight more easily. It is furthermore very sturdy and stiff, and yet, flexible enough for cruising! Deck size is a personal preference. It will almost always vary from user to user, feet to feet. But we personally suggest getting decks that are above 35 inches in length and 6 to 7 inches in width. This gives your feet plenty of room to retreat after a push ahead. Grip tape is that layer of abrasive, sandpaper-like tape that is slapped on top of your deck. It is there to offers grip and traction on your feet so that they do not slip or slide. When looking for a grip tape, the simple rule of thumb is to check the tack. It should be able to hold onto your feet. The truck of a longboard is unbeatably one of its most important parts. This is what decides the flex, flatness, and speeds and so on. And while choosing a longboard, you will come across boards that offer 2 different type of trucks. We personally recommend the drop-through truck. A drop-through truck is where you mount it on top and through the deck. It, therefore, makes the board closer to the ground and therefore flatter. This eventually means less leverage and less wobbling. However, this does compromise a little to turnings and carving. While the drop-down truck is where you mount the truck right under the deck. This gives the deck more height and better speed. It is furthermore more responsive to turning. However, they do tend to be less table at the end of the day. The part that is screwed onto the deck of the board is its base plate. And the angle it is set at decide the intensity and finish of the curves and turns the board can eventually make. The lower the base plate angle, the smaller the turn. The base plate on a cruiser board should at least go on to offer you 50 degrees, while downhill should at least offer 44 degrees. Wheels are no less important, but finding the right kind can be a job on its own. The 2 thing we suggest you look for in wheels is its size and hardness. The size, measured in mm, should be able to tell you the coverage and speed it can offer you. And the rule of thumb is that the larger the wheel, the faster the board. The hardness is measured in durometer. The smaller the number, the softer the texture. A 78a wheel would therefore much softer than a 99a. Soft wheels are great for rough, uneven road because it will eventually offer more grip and stability due to the texture. And harder wheels are better for smoother roads. Bearing are measured in ABEC ratings. the ABEC rating starts from 1,3.5,7 and 9. 9 being the best. However, ABEC misses out on many features in its accountability which is why it is a less credible measure. Many manufacturers will skate rate instead. If it is expensive, fancy or high-end; try and get a warranty or any other type of purchase assurance. Simple. Let’s start with one of the most popular reasons behind people getting a longboard in the first place: affordability! A longboard is obviously hundreds of time over less expensive than your car or bike. And well, for obvious reasons too. This thing is made from far less complex and inexpensive materials. However, you can expect a longboard to outlast a car if you get a high-quality one and also take care of it with regular pampers and repairs. A longboard may not reach speeds similar to that of a running car or train, but leave no doubt, it can get fast! This is especially possible on free roads or downhill streets. These boards can catch up speed ridiculously well and can, in fact, give bicycles and runners a good run for their money. One other great thing about longboards is that they can get into and through small spaces thanks to its size. So while your colleague and classmate are waiting in traffic, you could slip through and cruise away on the pedestrian walk faster than them! Also, who takes out the car for a 10-minute drive? Geez! If you are a socially and environmentally responsible person, then the longboard is like your magic carpet. This thing uses no fuel. No gas, no oil, no nothing. Your legs and muscles are the fuel to it. They emit no harmful exhausts that poke holes through the ozone layer. They have no honks to sound pollute and finally, they are little to no maintenance for a very long time. Even the materials used to make longboards are now very carefully picked from sustainable resources. Overall, you will sleep well knowing you did mother earth some good, and you will feel great! Speaking of feeling great, this aspect isn’t all in the mind; it makes your body feel great too! Longboards, like we mentioned earlier, need your muscles moving to be able to cruise. And it is, therefore, a wonderful and painless way to work your body! Your feet and leg muscles are being worked constantly, and you furthermore learn to create amazing balance on with your entire body as well. You could probably skip a leg day or two at the gym once you begin to commute on your longboard. Apart from this, one other benefit to using a longboard is that you get more air and more sunlight. Probably not much, but it can make a tremendous difference in your morning mood! 1. How do I know it’s time to chuck out my current longboard? Answer: The great thing about longboards is that they are buildable and repairable. In other words, if a wheel busts out, you can replace for a new one. Or, if the grip tape peels off, you can slap on a new one. Loose bearings? Get new ones. Essentially, a longboard will last as long as you take it and take care of it. However, there is, of course, an end to everything. One giveaway that signals that it is time to change your existing longboard is a damaged deck. If it is chippings, cracking or has snapped, then getting a new deck is all left to do. And with a price of a new deck, you can usually purchase a brand spanking new longboard so. yeah. The deck it is. 2. My 10 y/o is just starting with her first longboard. What would you recommend? Answer: Great question! For kids, or even adults, who are starting out on a longboard for the first time, we recommend getting boards that come with a cruising deck as opposed to a downhill deck. This is due to the fact that downhill decks can catch speed in a second and can, therefore, be dangerous. Besides that, cruising deck offers more stability. 3. Any particular gear I must wear or put on the whole longboarding? Answer: Initially, start with a pair of knee and elbow pads. And if you are a special kind of a klutz, then maybe a helmet as well. This is especially for when using a downhill board. But yeah, you can take the same measures on a cruiser as well. However, as you slowly become accustomed to the board, you will no longer feel the need to wear any special gears. 4. Can I leave my longboards outside? Or do I need to keep it inside my home? Answer: That’s a great question. More or less all longboards are made to be weather resistant….some more, some less; but still weather resistant. However, this doesn’t mean they are eventually immortal and indestructible. They will, in fact, start to rust and warp if you keep in under harsh weather conditions for too long. And you can’t blame the manufacturer for that. Ideally, you would store it indoors. If it’s the dust and dirt on the wheels that are worrying you then we suggest wiping it off on the rug before entering the house…just like you would with your shoes. Longboards are a huge hit, and now you know the many reasons why! They are healthy, convenient and super affordable…well at least two other means of transport and commutation they are. However, finding that perfect board is easier said than done due to the hundreds and thousands of them lined up for you. That is where our buying guide comes to play. Use this guide as you checklist the next time you are shopping for your board. And if you want to skip the hassle altogether, then our detailed reviews of 10 of the Best longboard for girls are ready and waiting. We have everything from starter to pro boards, basic to extravagant, lower-end to higher-end. You will not be disappointed, and that’s a promise! With this, it’s a wrap to our take on the Best longboards for girls. We hope you will find our guide heaps useful. Thank you for staying with us and we will see you next time. Need more related exclusive products to watch! I precisely wanted to appreciate you again. I am not sure the things that I would have done in the absence of the type of smart ideas shown by you directly on such problem. It has been an absolute hard situation in my circumstances, nevertheless observing the very professional form you handled that forced me to jump over fulfillment. Now i’m happier for the information and in addition wish you really know what an amazing job you have been putting in teaching other individuals through the use of your site. I am sure you have never met all of us.